Some people consider staying in hotels to be a necessary discomfort which is a “cost” of travel, both financially and emotionally. To them I say, “You haven’t been staying in the right hotels!” Hotels offer many benefits beyond providing a place to spend the night. First, of course, and not a trivial consideration – a hotel offers a place to sleep (or, as needed, to sleep with air conditioning). Many hotels have followed Westin’s lead and fitted their rooms with a version of Westin’s pillow-top Heavenly Bed, and many hoteliers will proudly tell you the thread count and source of their linens. These really are more comfortable than the old favorite at home, so don’t think that you won’t be able to sleep because the bed is different. But that is just the beginning. Eloise was a very spirited girl who knew everything about The Plaza. Many hotels have swimming pools and fitness centers. Especially for children who do not have easy access to a pool at home, a place to swim can be a major delight. Many top city hotels have special amenities for their youngest guests. 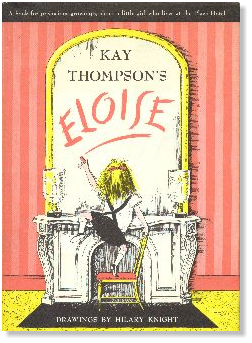 (Remember Eloise who lived at The Plaza in New York? That hotel brings her world alive for their young guests in the Eloise Suite.) Staying in a hotel affiliated with a theme park brings the fun right into your room. Breakfast with the characters visiting each table is followed by early access to the park attractions. So you have slept well and the young at heart are delighted. What more could you ask of a hotel? Perhaps you have always thought that a hotel’s meeting rooms are just for business folk to conduct meetings with projectors. Have you considered using a hotel function room to host your own social gathering? These same rooms can be private dining rooms for your Significant Birthday Party which will be too large to host in your own home. They have enough tables, chairs, food prep and clean-up staff to make your gathering much easier to host. And after the party the guests from far away can enjoy their own private hotel room to put the youngest to sleep and take turns re-joining the party rather than departing entirely. Even without the big birthday party, a nearby hotel can be your additional bedrooms for guests you cannot accommodate at home. You can “host” and visit with your guests who are allergic to your pets or who need handicapped access at a nearby hotel and still allow plenty of “space” between guest and host. Or you can leave your house in the care of the young and lively guests and take yourself to a quiet refuge a few blocks away. Do you have a very early flight at the start of your vacation? Yes, it sounded like a good idea when you booked it but now it sounds too early. Stay at an airport hotel which offers a Park and Fly rate. This includes hotel parking for your car while you are away at less cost than you would pay for most lots. You stay the night before your flight, then wake up, get on the hotel shuttle, and five minutes later you are checking in for your flight. Isn’t that better than leaving home at Oh-Dark-Hundred hours? You can also stay the night at the end of your trip, making re-entry easier after a very late arrival. Staying at a really special hotel is a wonderful and easy way to give yourself a treat. A hotel stay can pamper you with many luxuries, small and large. Waking up well rested is great, but waking up well rested and with a dynamite view? Priceless! Do not overlook the architectural and culinary treats at some hotels. 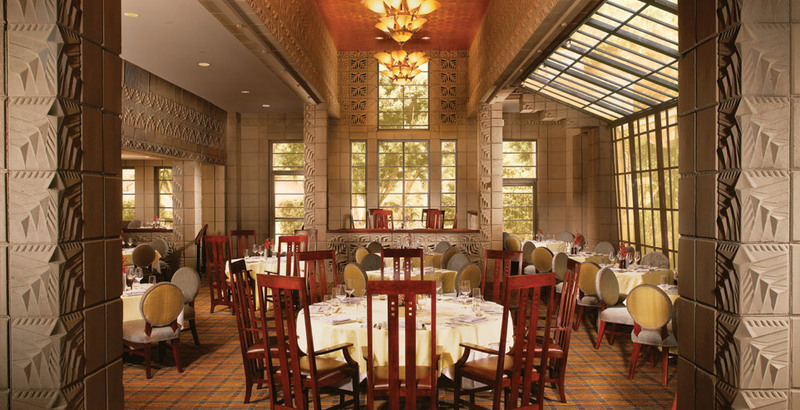 This is the Arizona Biltmore dining room named for Frank Lloyd Wright. This entry was posted in Travel, Uncategorized and tagged airport, Arizona Biltmore, Eloise, Frank Lloyd Wright, heavenly bed, hotels, park and fly, resorts, travel. Bookmark the permalink. Ah! The Biltmore. How I do love to stay there. An evening supper on the open-air terrace is very romantic. How I miss them! Visiting them is llike returning to a favorite dream. The Biltmore is Tops on my Short List of favorite places. Thanks for writing.